President-elect Donald Trump left New York for Washington, D.C. Thursday morning, where he is meeting with Barack Obama at the White House to begin the peaceful transition of power. Breaking with tradition, Trump did not allow his press pool to travel with him to the nation’s capital. 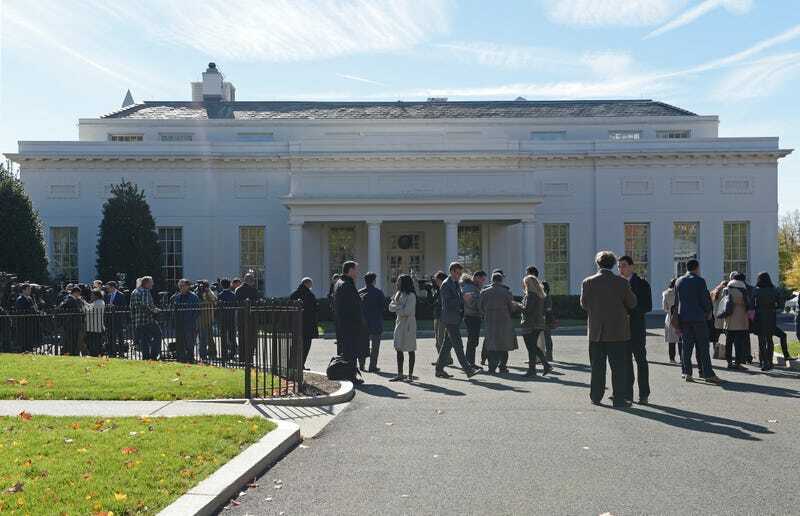 Trump, according to New York Times White House correspondent Julie Davis, is “not allowing coverage of his movements today.” That means that there are no photographs of him actually arriving at the White House. Fortunately, the White House press pool will still be able to cover his meeting with Obama in the Oval Office. So at least we have that to look forward to! Meanwhile, Obama chief-of-staff Denis McDonough gave Trump son-in-law Jared Kushner a tour of the White House grounds. Fortunately, a federal law passed in 1967 prohibits the appointment of family members (including in-laws) to serve directly under the president.